It is very challenging to develop electric aircraft due to the low battery power density. The first product we are developing is a general aviation(GA) electric CFJ airplane shown below. It carries 4 passengers with a range of 360 miles and cruise speed of 221 Miles/h. It is based on current Li-Ion battery power density of 250Wh/kg. With the battery technology continuing to be developed, the aircraft payload and range will be increased scalable to the increasing battery power density. We use the ultra high aerodynamic efficiency to compensate the current low battery power density in order to achieve a range more than twice longer than a same size conventional design. The aircraft also has a very short takeoff/landing distance with very low noise due to the ultra-high lift coefficient. A distributed propulsion system is used to ensure high safety and reliability. We have started to study applying CFJ to electric transonic aircraft with cruise speed of 500miles/h, which is far more difficult than the GA due to its much higher cruise speed that is near the speed of sound. 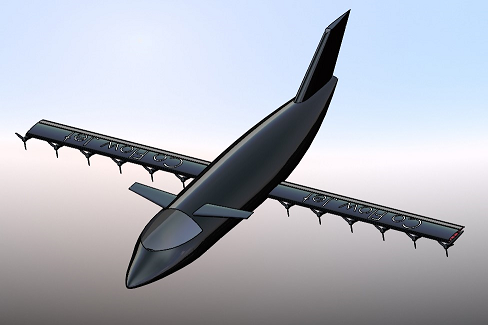 The following is a conceptual design of a electric CFJ regional airliner with 20 passengers. We believe the CFJ wing with its superior performance is the most promising unique technology for zero emission electric aircraft. Our mission is to develop and deliver the most advanced environment friendly aircraft to the world. Coflow jet wing's capability to sustain ultra-high angle of attack with super-lift coefficient foster a new concept of vertical takeoff/landing (VTOL) aircraft, which can achieve substantially higher efficiency at vertical takeoff and landing process than the conventional design with very low noise. Furthermore, at cruise, the interaction of the propellers with the CFJ wing also enhances the cruise efficiency. We have developed two designs with full electric propulsion, one for a 4-seats urban transportation vehicle (right) and one for short haul cargo vehicle (below). 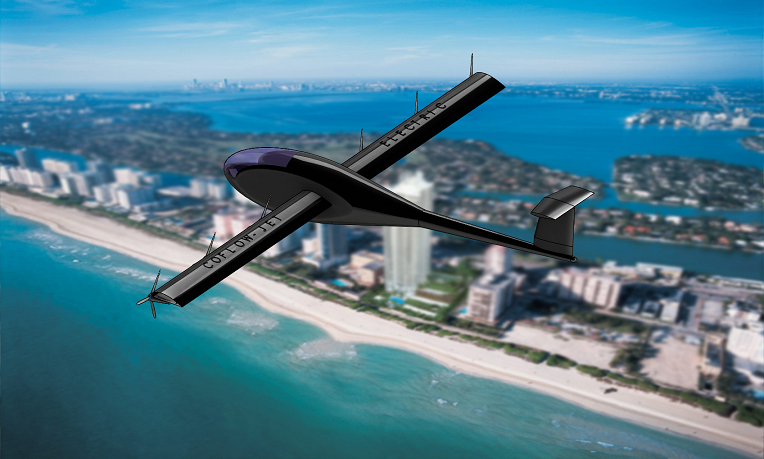 Using the current battery energy density of 260wh/kg, the CFJ-VTOL 4-seats electric vehicle has a range of 250 miles and expected community noise less than 67 dBPL. The electric CFJ-VTOL eCargo has a payload of 1.5 ton and a range of 300 miles.